No need to live above a bakery to enjoy the warm aroma of freshly baked bread on a daily basis. 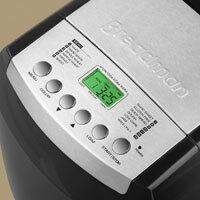 With an array of convenient features for ease of use, this Bakery Pro bread maker comes in handy any day of the week. Its exclusive dual bread-pan baking system allows for baking a traditional loaf up to 2-1/2 pounds or two 1-pound loaves simultaneously. Make anything from fresh cinnamon-raisin bread for breakfast toast, banana nut to serve with tea, or a loaf of whole wheat to serve with a hearty stew for dinner. Choose from 14 baking functions, including low carb and gluten free, as well as the option to make a variety of doughs and jams. Unlike other bread makers, the machine's exclusive kneading paddles collapse automatically before baking to prevent holes from baking into the bottom of the loaves, and its exclusive fruit and nut dispenser adds extras to the dough at the right time automatically--no need to wait around. The bread maker also provides a 15-hour delay timer, which makes it possible to wake up to--or come home to after a long day--a loaf of freshly baked bread ready to be sliced and slathered with butter and jam, spread with soft cheese, or enjoyed with other toppings or on its own. Accessories include a collapsible measuring cup and an adjustable measuring spoon, and the manual includes over 80 recipes. The bread machine measures 14 by 19 by 12 inches and carries a two-year limited warranty. 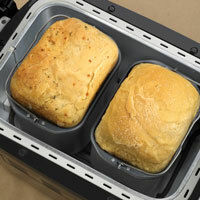 Get the bread maker that makes it easy to bake like a pro and really bring home the bakery. This unique, 2-1/2-pound bread machine offers a wide range of features that you won’t find anywhere else. 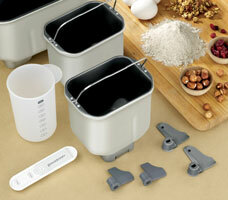 You’ll enjoy all your favorite baked goods at home, with exceptional results you’d expect from a baking professional. We start with a dual bread pan baking system, which allows you to bake one standard loaf up to 2-1/2 pounds or use the side-by-side 1-pound loaf pans to make two one-pound loaves of bread simultaneously. This way, you can make a traditional whole wheat bread for dinner and bake a dessert bread for after the meal at the same time. Inside the bread pans, our exclusive patented collapsible kneading paddles collapse automatically before baking begins, to prevent the paddles from sticking in the bottom of the loaf as it bakes. This keeps the paddles out of your baked bread, to help prevent rips and tears caused in the bottom of the loaf by removing the paddles. 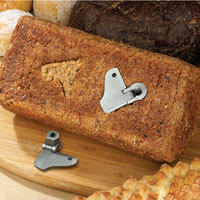 It’s perfect for better loaves and unbroken sandwich bread. 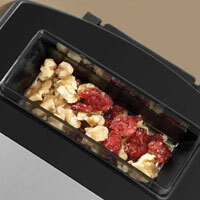 Our final exclusive patented feature is our automatic fruit and nut dispenser. This handy feature allows you to add up to 2/3 cups of fruit and nuts into the dispenser to release automatically at the right time for perfect fruit and nut bread without waiting around. Instead of waiting around to add the fruits and nuts into a loaf at the add ingredient beep, the machine does it for you automatically. This way, your family can enjoy hot baked cinnamon raisin bread for breakfast without waking up before the sun rises to add the raisins. In addition to these Breadman exclusive features, the Bakery Pro Bread machine offers a wide variety of your favorite programming options including low carb, gluten free, dough and jam. You also get rapid bake settings on white, whole wheat and sweet loaves, as well as a handy bake-only setting for specialty baking with ease. This model also features our up to 15-hour delay bake timer that lets you adjust the delay anywhere from one to fifteen hours. In addition, you have a 60-minute keep warm cycle that keeps finished loaves warm for up to one hour, plus a 7-minute power failure protection system that saves program settings for 7 minutes in case of a power outage so you can still get a great loaf even if there’s a surge or brown out. The Bakery Pro comes with 3 bread pans; one bread pan allows you to bake up to a 2-1/2-pound loaf, while the two 1-pound bread pans allow you to bake two different loaves at the same time side-by-side. In addition, we give you a collapsible measuring cup and adjustable measuring spoon to help you get easy, exact measurements for the best loaves of bread. The Use & Care manual comes in an attractive, spiral-bound booklet along with over 80 unique recipes to excite your taste buds and inspire your baking creativity.